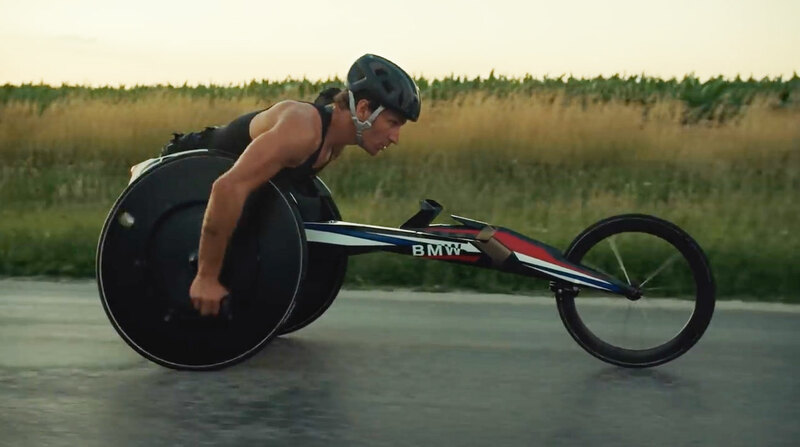 Here's a powerful statement: To underline its commitment to all Olympians ahead of the 2016 Rio Games, BMW has released "Built for Gold." Created by KBS, the spot is galvanizing, dramatic and powerful. It stars Josh George, who, drenched in sweat, advances hard under a setting sun … in a BMW-designed performance wheelchair. At the 2008 Paralympic Games in Beijing, George won gold in the men's 100 meters-T53 event. He has also represented the U.S. as a SportsUnited Sports Envoy, a program designed to cultivate recreation for at-risk, sometimes disabled, kids. And the ad—as much a plug for BMW as it is for him—does him justice. As he powers down the roads of Champion, Illinois, cultural discomfort about disabilities gets shelved. It's hard to think of him as anything but an athlete, one who's made serious sacrifices for greatness. The Paralympics are as competitive as the Olympics themselves, but haven't always been appreciated as such. This started changing in 2012, when the U.K.'s Channel 4 released "Meet the Superhumans," a high-energy, emotional piece that wordlessly underscored the sheer power and defiance of Paralympic athletes. Procter & Gamble picked up the mantle—this time for moms—for the Paralympics in 2014. And Channel 4 reprised its "Superhumans" message this year, with a playful and infectious musical spot that taps completely different emotional chords from its previous work. Today, a far broader audience is rooting for Paralympic athletes than before. "Over the course of our partnership with Team USA, we have been committed to advancing athletic performance through technology transfer initiatives which help to address their training and equipment needs," says vp of marketing Trudy Hardy of BMW of North America. "This one is special not only because it presents a unique design challenge, but it helps solve a bigger mobility challenge for our Paralympic athletes." The wheelchair took a year to build and was created with 3-D scanning and printing techniques to fit each rider, maximizing the chassis' aerodynamics. Associate director Brad Cracchiola of BMW Group Designworks, which leads these design projects, calls it "one of the coolest projects I've worked on. To be able to take what I do on a day-to-day basis and combine that with the design of this wheelchair is a once-in-a-lifetime opportunity." The ad's conclusion probably describes it best, though, when the somber voiceover rises to climax: "This chair was built for breaking things—to reimagine, rethink and redefine what it means to be an athlete. And once every limit has been passed, every expectation smashed, and every record broken, together we will have built something great." "Built for Gold" will air on NBC during the Opening Ceremonies of the Olympics. The Paralympics kick off Sept. 7, following the Olympic Games. During the Olympics Closing Ceremonies, a social component will go live to keep momentum up in the two weeks preceding to the Paralympics. It will appear across both broadcast and digital until the games end on Sept. 18.